Work as Systems Analyst for a company in Portsmouth, United Kingdom. Program mostly using LabVIEW and use MS SQL for database. Trying to get to grips with Visual Studio when I get chance. We are back for the fourth season of Formula Pi and the first testing session didn’t go quite as smoothly for me as I had hoped. Not a complete disaster as I have competed before and there are a number lessons that can be learnt. Firstly, here’s the recording just as my run is about to start. The Raspberry Pi booted as expected with the RGB LED changing colour to indicate that it was ready. The light sequence started GREEN, RED, GREEN… and nothing. A quick reboot and exactly the same so testing continued with the next competitor. I checked the code to see if I had accidentally used the wrong controller code (Yeti vs Monster) but all seemed OK. For this season there was a new base SD image being used and a slight change to some of the controller code so I had created a clean install and made a few simple changes to improve the lane handling of the bot but nothing special. My intention was to just run basic code to check the upload was working and the base install was sound. There had been a few problems with running the simulation software although I had assumed that this was due to upgrading my laptop to Windows 10. No matter, I’ll sort it after testing ready for the first round I thought. 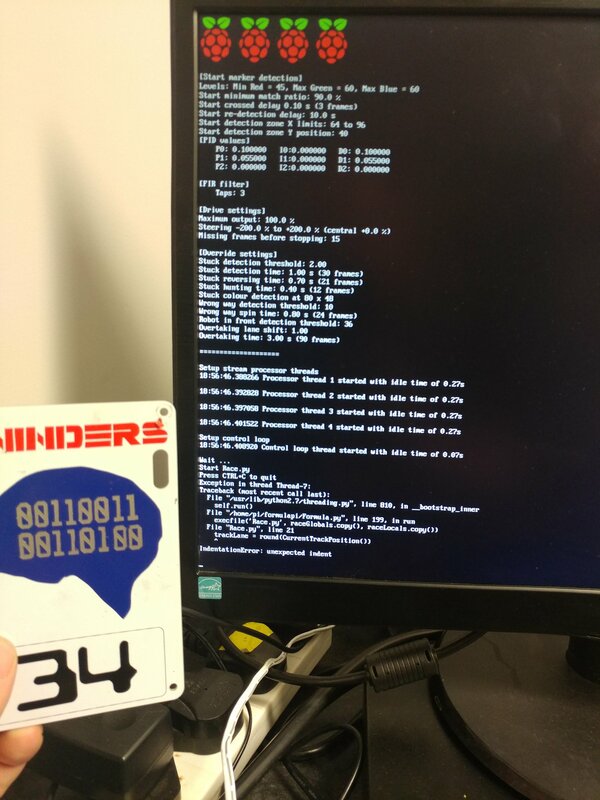 Shortly after the testing session had finished I received an image from Tim Freeburn (Chief Robot Wrangler at PiBorg) with a picture of my lid and a screen showing an Exception – ‘IndentationError’. This is what stopped my car from moving off the line but how did I get into this position? My code stopped due to an indention error in the main Race.py code. I had not tested properly as I couldn’t get my simulation code to run. Some further investigation is needed but I am sure I can learn from this testing session, that will have to wait until next time.